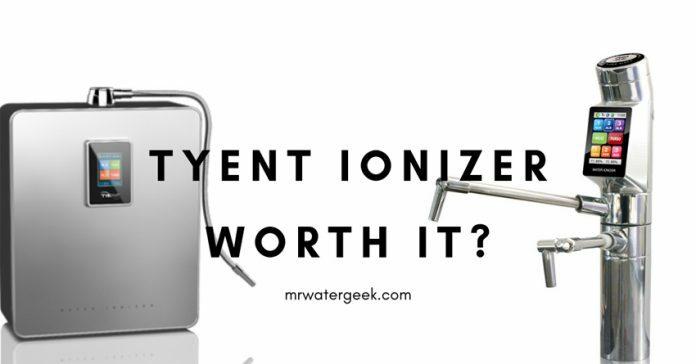 This Tyent Water Ionizer review will take a closer look at this popular machine and decide if it’s worth it or not. 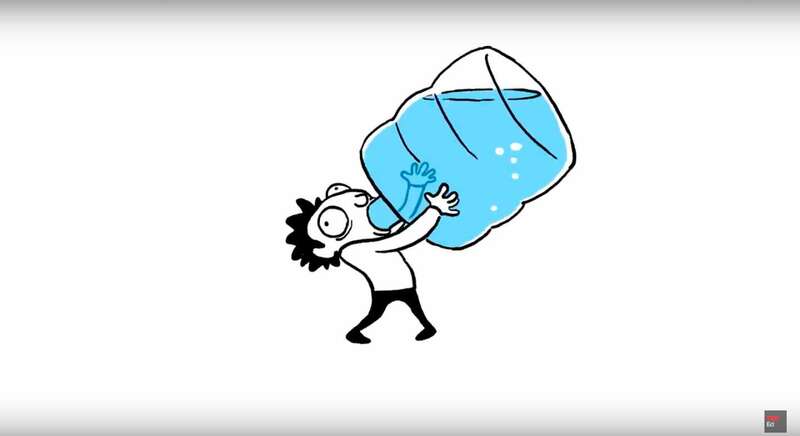 Alkaline water is trending now more than ever, but why is alkaline water so impressive? Well many people believe that a high level of acidity in the body is the cause of chronic illness and serves as a breeding ground for unhealthiness. The idea is that eating high alkaline foods and drinking alkaline water restores acidity and neutralizes the body. Alkaline water is also rich in antioxidants. This is because it causes oxidation that can help prevent the destruction of cells. And it does all this without calories unlike alkaline foods. Tyent produces some of the most advanced ionizer’s available on the market today. However, they are very expensive so this article will review them in order to decide whether they are worth it or not. 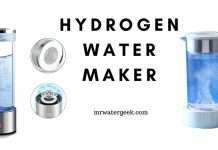 Do Tyent Water Ionizer’s ALSO filter the water? **UPDATE This Special Offer is ENDING Soon** Use the exclusive Tyent USA coupon code: WaterGeek to get $1600 of FREE upgrades, extras, FREE equipment and lifetime warranty (Incl + FREE US Shipping). More and more people are thinking about water quality now more than ever before. Especially now as tap water seems to have so many potential problems – despite still being relatively safe in most Western countries. 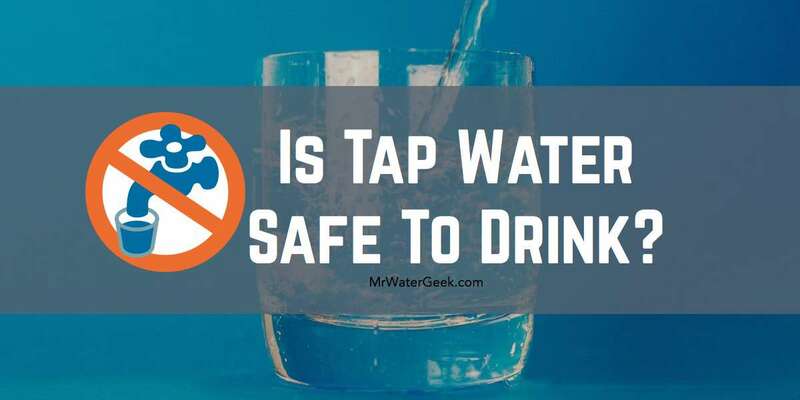 New reports show that it’s possible for tap water to be contaminated with a number of different impurities, hormones and chemicals. Water ionizers like the one from Tyent provide a sophisticated solution to this problem. They not only filter and purify your water, they also offer options to create water full of antioxidants. It is an Asian-based company established more than a quarter of a century ago but widely available in the US market through Tyent USA dealers. They produce high tech equipment for producing alkaline water. They particularly specialize in water that is said to provide health and wellness benefits. This is why they have a fan base that includes many athletes and celebrities. Tyent ionizer’s use multi-stage filtration processes to remove hundreds of poisonous toxins. This includes things like pharmaceuticals, herbicides, pesticides and much more. In Japanese, the word Kangen means “return to origin”. However, the most important thing about Kangen Water is that it’s not just another alkaline water machine but an MLM business. Multi-level marketing businesses are often criticized as “pyramid schemes”. Although many people don’t specifically complain about the Kangen machines themselves, however, the business model means that the prices are vastly inflated. Tyent, on other hand, just produce ionizer’s and do not work off any multi-level based business models. This means their prices are typically cheaper than Kangen. Aside from being an MLM company that is geared towards recruiting and enriching more sales people, there are other business problems too. For instance, the Japanese consumer protection agency once closed down the company Enagic (the company behind Kangen) for 9 months. This is after the company was convicted of deceptive and unethical business practices. One of the biggest problems are lower value machines sold for unreasonably higher prices. Enagic Japan government scandals revolve around advertising campaigns and scientific claims that are not based on evidence. Tyent on the other hand is an accredited member of the BBB (Better Business Bureau) that comes with an A + rating. 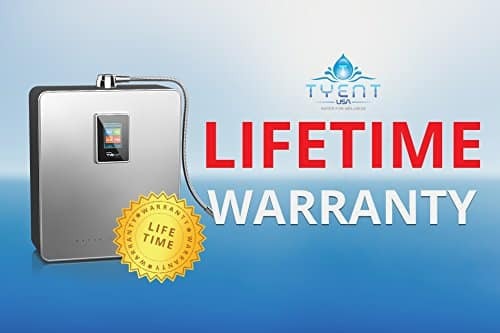 Unlike Kangen, Tyent offers all customers a LIFETIME WARRANTY if you buy direct from Tyent and use coupon code: WaterGeek. Installation Type Counter top machine connected to tap faucet ONLY. 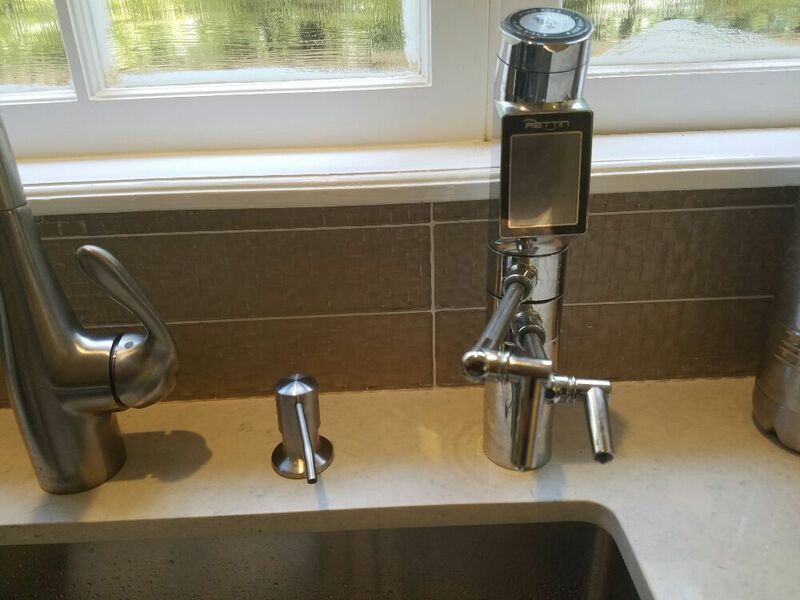 Under counter unit WITH counter top touchscreen faucet. Power Settings 3 Acidic, 4 Alkaline, 1 Turbo (for both alkaline and acidic output) 1 Neutral. Fully adjustable with 99 presets per level. 3 Acidic, 3 Alkaline, 1 Turbo (for both alkaline and acidic output) 1 Neutral. Fully adjustable with 99 presets per level. How do the filters work? Tyent YT ACE 11 also works with a double membrane 0.01 micron active carbon / EM ceramics filter combined with a 10 Stage Ultrafilter (UF) Membrane Filter. Tyent Rettin UCE-11 Turbo works with a double Membrane 0.01 micron active carbon / EM ceramics filter combined with a 10 Stage Ultrafilter (UF) Membrane Filter. Filter lifespan (how long do they last before you need to replace them?) 9 months or 3600 litres (approximately). 9 months or 3600 litres (approximately). Where to buy replacement filters? Buy direct or from places like Amazon. Buy direct or from places like Amazon. Plates YES comes with x11 mesh/solid hybrid plates baked and dipped. YES comes with x11 mesh/solid hybrid plates baked and dipped. Voice Activated? Yes, a voice operation system with MP3 sound quality. Yes, a voice operation system with MP3 sound quality. Safety Features YES - flood prevention safety sensor. YES - flood prevention safety sensor. Unlike many other water alkaline machines the Tyent UCE-11 is a water filter and alkaline machine that fits easily under your kitchen sink. Under-counter element of the Tyent that connects directly to your pipes. 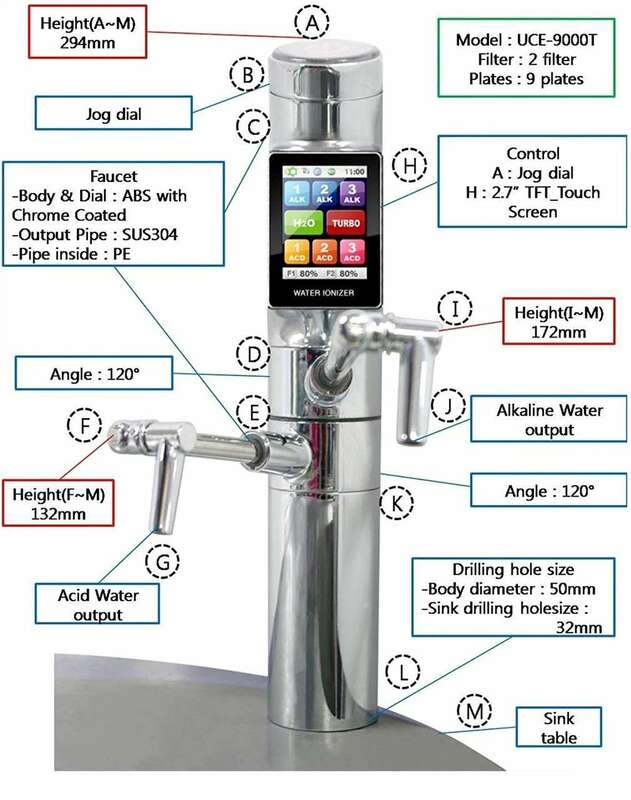 This under sink alkaline water ionizer means that you will not see it most of the time but instead left with a high tech touch tap that allows you to program the device. Made from high quality stainless steel and connects directly to your water pipes meaning that it treats your water on contact. 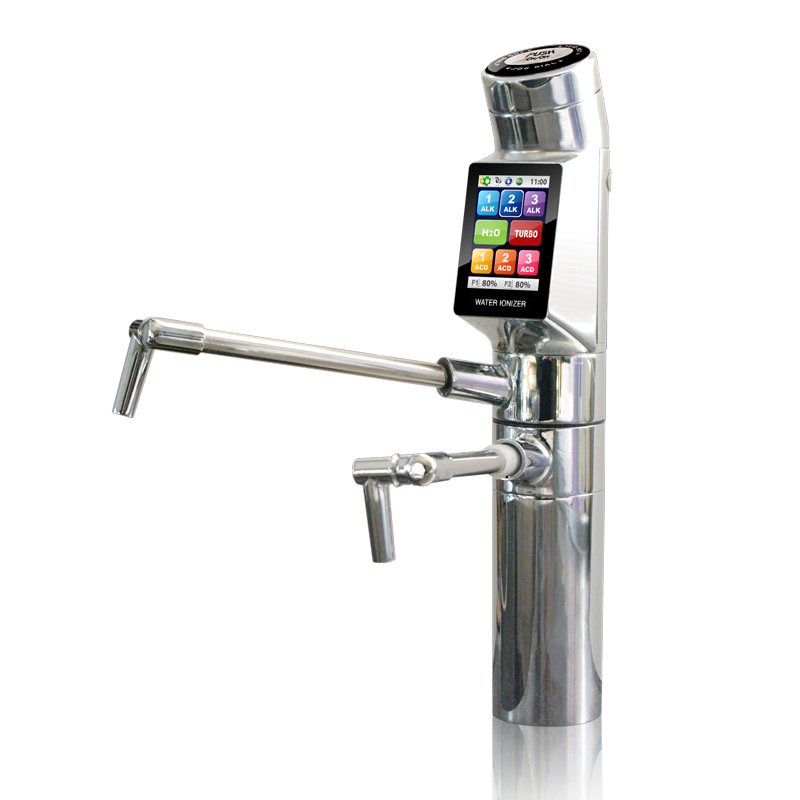 This is probably the only touch screen water ionizer tap available today. The user interface is user friendly and colorful. In fact the interface looks more like a smartphone. Tyent UCE-11 gets 4.5 out of 5 stars from verified customers. As already discussed in the previous sections, the Tyent ionizer uses a double filter. This system can eliminate 99.9% of water contaminants. This includes the types of things that typically appear in tap water. For instance, heavy metals, chlorine, mercury and lead. One of the best things about the Tyent is how there is almost no risk in buying it because of the generous warranty. First of all, you effectively get a 75 day trial because you can easily return it in this period. In addition to this, you get what the company calls the “Platinum Lifetime Warranty”. This essentially protects you from any future system errors and a life long protection from the machine breaking. 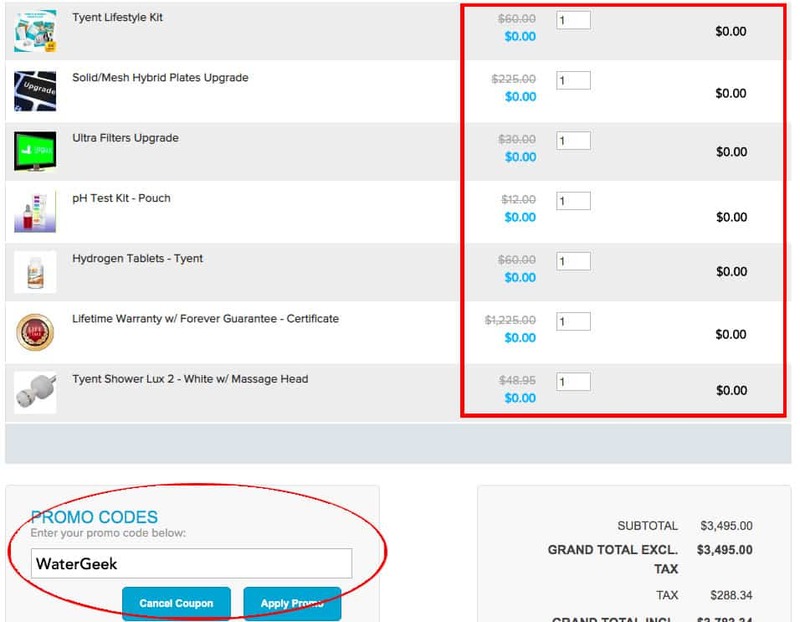 To make sure you get the LIFETIME WARRANTY buy direct from the Tyent website and use coupon code: WaterGeek. The first concern that anyone will have when looking at this as a possibility for their home is how easy is it to install? The video below shows that you don’t necessarily need a plumber or electrician to do it. Simply having some basic plumbing skills (and knowing where to turn off your water at source) means you can install it yourself. Please note that the video below is not for the Tyent UCE-11 but for the UCE-9000. However, they are very similar models and will go through a similar installation process. If you don’t feel confident in doing it yourself, Amazon now offer highly rated and competitively priced professional plumbing services. This means that you can easily hire a plumber to install this under sink filter knowing that you have the world famous reliable customer support from Amazon if anything goes wrong. The Tyent UCE-11 is a water filter that also creates alkaline water on tap. All of this is done through a very sophisticated high tech touch interface. It offers three performance levels for the production of both acidic and alkaline water. Each of these levels has 99 pre-set settings that allow you to configure the ionizer as needed. You can set your preferred water selection at the touch of a button. It is capable of generating alkaline water with an ORP of -1050. This level of antioxidant is the best you can find with water ionizers. 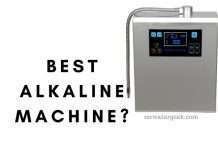 Combine this with the wide range of pH levels, and you will have one of the most powerful alkaline machine’s available today. Another good thing about the Tyent UCE-11 is that it only weighs less than 6 kilograms and has a variable voltage between 100 and 240 volts. This results in an adjustable energy consumption, making it cheaper to run so that your electricity bill is not crazy high. This also allows the generation of water with a pH range between 1.7 and 12.0. The device measures 385 square inches, so it should fit well with most types of kitchen countertops. This is important since the Tyent UCE-11 is an under-the-counter solution so will not use up precious space on your countertop. Needs some installation to get it to work. So you either need some basic plumbing knowledge OR need to hire a professional plumber. Also note that EVERY alkaline machine needs to be plumbed in. Dual ultra filter that removes 99.9% many contaminants. The large unit fits under the counter so it doesn’t take up precious countertop space. BPA free, lead free and only makes use of FDA approved plastics. Fits in with the design of high end kitchens. As the name suggests, it comes with 11 huge platinum plates, which means superior effectiveness. Rated “Water Ionizer of the Year” in 2012, ’13, ’14, ’15 (source: waterionizer.com). If the under-counter version of Tyent is not right for you then they also have counter top versions. This is a lot easier to install when compared to the under counter water ionizer’s. The ACE-11 offers all the same features as the UCE-11. This machine produces a water pH level between 2.0 pH to 12.0 pH this is along with a negative ORP up to -1155 mV, which is very good. However, you can select the exact setting that you want through the smartphone style touch screen. As you can see in the picture above, the Tyent has 2 easy load filters. The “smart spout” means that it’s easily adjustable so you can choose to install this alkaline machine ionizer on the right or left side. The “11” part of the ACE-11 means that it comes with 11 platinum coated medical grade titanium electrode plates. This currently is the highest in the industry. It’s much smaller than almost all other bulky alkaline water machines. And it’s nice to have this on the counter top because of the luxury material finish, which means it will fit in the most lavish kitchen decor. Small compact size: 5.3″ Depth x 11.8″ Width x 13.9″ Height. Comes with a hydrogen boost option. 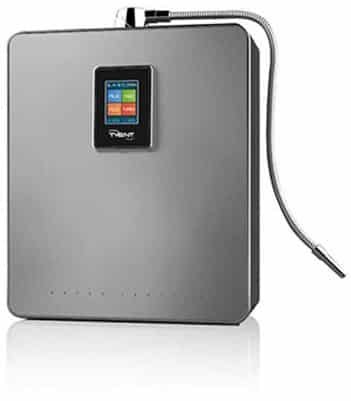 Yes, this is the best water ionizer that I’ve seen on the market today. 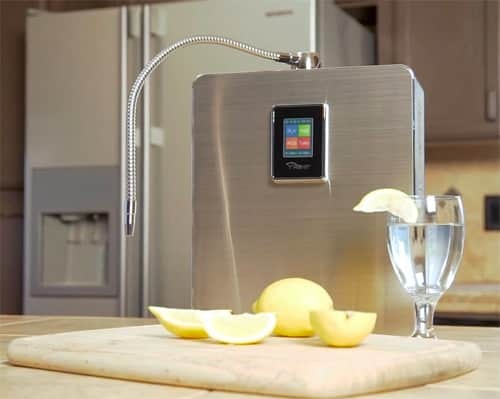 The Tyent UCE-11 is better than my previous favorite water ionizer (the Bawell Platinum) because it can be kept under the counter and the user friendly touch screen tap. I would like to say that this system is not cheap. But then again the prices are similar to high end alkaline water machines and the others don’t come as under counter units or work directly from the pipe (instead of just connecting to the tap). 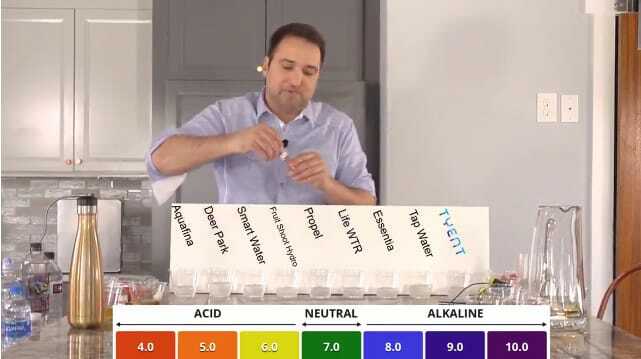 The Tyent also has a lot of different levels of alkaline and acidic water which means that you can be very picky about getting the exact level that you want. 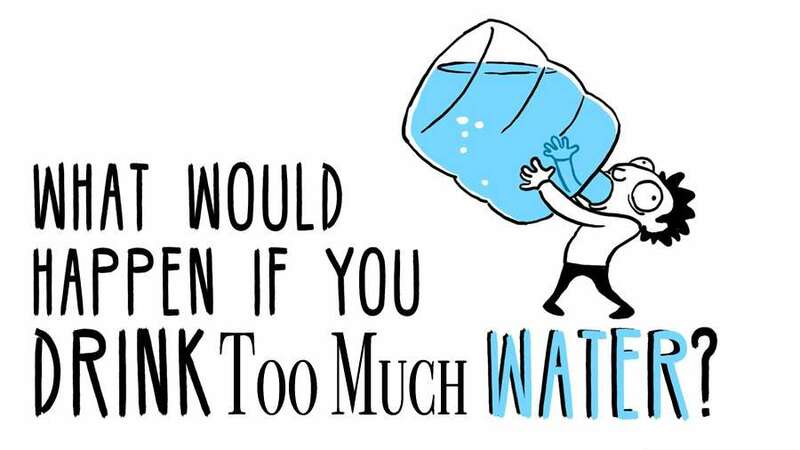 It’s water filters are powerful enough to treat heavy metals like lead and mercury so you really get the best drinking water possible. But like I said, it’s not cheap. If you decide to buy, make sure you buy direct to enjoy the full guarantee and warranty – as well as other discounts and gifts. + pH Test Kit Pouch. + Tyent Shower Lux White Massage Head. + Mesh/Solid Hybrid Plates Upgrade. + Lifetime Warranty w/Forever Guarantee Certificate.